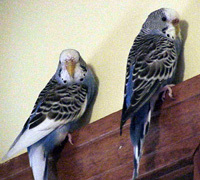 You can read about Santo's Arrival in 1999, as the third member of our parakeet flock. Santo enjoyed very much being with the other two parakeets and was always the follower of the bunch, watching what the other two did. In the years that have followed, Santo has settled into the flock. She's still the shyest of the three, the most cautious, but she enjoys fweeping as much as the others do! Santo is also something of an acrobat. 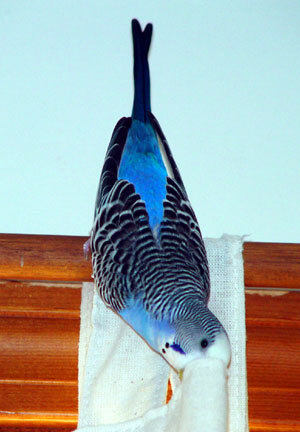 Here's a picture of her hanging from a curtain rod, so she can nibble on the curtains below!